Concussion Lawsuits – Are the Floodgates About to Open in the MMA World? This weekend another sports related concussion lawsuit has hit the media. This time its the NHL making headlines. The family of late enforcer, Derek Boogaard, has filed a wrongful death claim against the NHL arguing the League is responsible for brain damage the feared fighter sustained in his years playing professional hockey. He had at least 66 on ice fights in his professional career. Such lawsuits are becoming more commonplace in the world of professional sports. These lawsuits are often grounded in the theory that sports organizations allow athletes to compete while undermining or concealing the risk of injury. So what does this have to do with MMA? It is likely a foreshadowing of things to come. More importantly, it is a good opportunity to get ahead of a potential problem for the betterment of the sport. The NHL and NFL are mature leagues with a lengthy history. There are generations of retired athletes with long term data to draw from comparing these athletes to retired members of the general population. One pattern that is becoming clearer is that of Chronic Traumatic Encephalopathy and its relationship to long term involvement in contact sports. Athletes who experience repetitive brain trauma over their careers have a greater chance of developing this degenerative disease. 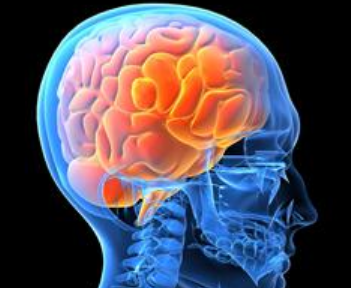 The relationship of brain dysfunction and exposure to repeated sub-concussive trauma is also becoming better understood. As the long term health of more retired athletes is studied, a greater understanding of this pattern occurs. 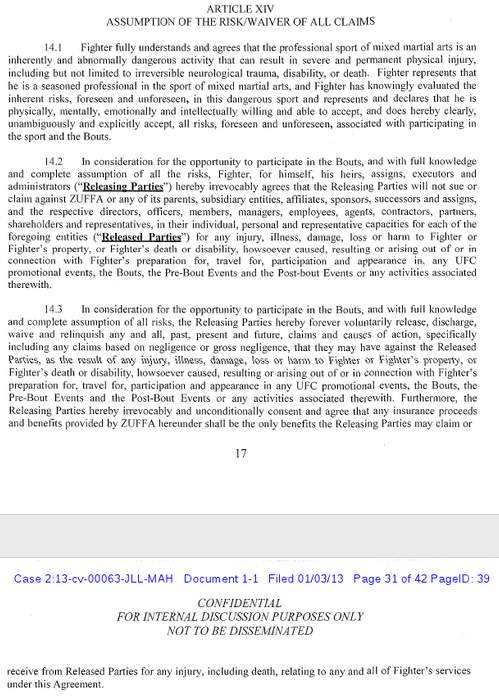 While there is clearly homework to be done in terms of this link and MMA, the one thing the UFC and other MMA organizations can learn from these lawsuits is to get ahead of the curve. There is nothing to gain by taking an ostrich approach to brain trauma. Instead MMA leagues should take meaningful steps to acknowledge these risks head on and encourage their athletes to learn about the full known risks that come with participation. As retired Canadian MMA fighter Nick Denis demonstrated, not all fighters agree to carry on with a career in MMA after learning of the risks. Failing to facilitate athlete’s appreciation of CTE and other long term consequences not only undermines informed participation, it can also lead to the legal troubles that are now plaguing the NHL and NFL. Dana White, president of the UFC, has, to his credit, done much for the growth of MMA and aiding in the creation of its regulatory framework. However, in the process the plain speaking promoter has made some foolish representations along the lines of MMA being the ‘safest sport in the world’. This hyperbole can be forgiven by the average fan who understands that Dana is speaking from a desire to assist the growth of the sport and refuting political resistance such as the well worn ‘human cockfighting’ soundbite. Such reckless statements, however, can have an unintended impact in the legal context if a fighter who is diagnosed with CTE turns to legal action. Organizations will be best served by not undermining these risks. Concussive injury should not be downplayed as it was by the flippant attitude shown to Matt Mitrione in face of his voiced concussive concerns in season 10 of TUF. While this may have made for better ratings, encouraging an attitude which undermines concussive injuries is not in the long term interests of athletes nor MMA organizations. If this attitude is pervasive in the organization there could be unwanted legal repercussions down the road. Stake holders should not wait for the legal floodgates to open before addressing this issue.